Nurture Vapor Cream is far more mild than other vapor rubs, containing herbal ingredients which have been found to help relieve congestion as well as symptoms of cough, cold, flu, fever, sore throat, earaches, headaches stomachaches, asthma and allergies. The pure essential oils used also contain anti-viral properties. You don't have to be a baby to benefit from this wonderfully soothing cream. Suggested Use: During illness, apply a small amount (espcially before meals or sleep), to congested and achy areas: on and under the nose, forehead, temples around ears, and on the chest and back as needed. 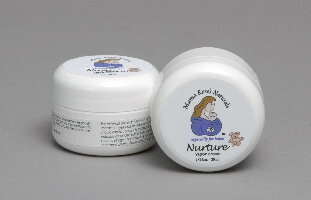 Nurture Vapor Cream also works wonderfully as a soothing foot cream on tired Mom Feet! Ingredients: Nurture Vapor Cream contains loving touches of lavender, eucalyptus, ravensara, grapeseed oil, jojoba, shea butter, rosehip seed oil and Vitamin E.